This grizzly bear cub because of the size is from late May or early June. 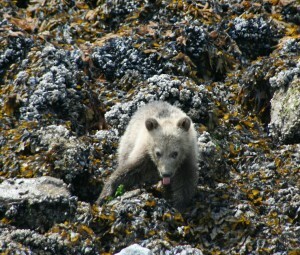 The mother grizzlies bring their cubs to this part of Knight Inlet to feed on the beaches and turnover rocks. This inter-tidal zone “food” is high in protein and is made up of crab, clams, barnacles, amphipods and other tiny invertebrates. The “beach food” is important because the only plant food available at this time of the year is the sedge grass. Sedge grass also very high in protein and with inter-tidal zone food it keeps the grizzly bears in good health until the salmon arrive. 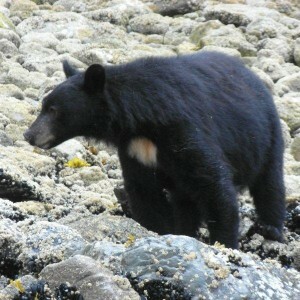 And no the cub wad not alone on the beach but far enough from mother for a good solo picture. If you click on the photo to enlarge it and then zoom in the cub is not licking anything I can see just sticking out it’s tongue. “Humpback whales often feed by lunging – moving quickly toward a school of prey with their mouths wide open, then closing their mouths and filtering the salt water out using their baleen. Researchers at the University of British Columbia learned from tagging humpback whales that during these lunges, the whale drops its lower jaw, creating drag that helps fill its mouth with prey and water. The effective, but energetically-costly feeding technique explains the relatively short dives humpback take while feeding.” a quote from Jennifer Kennedy, About.com Guide. Gary Wilson from Australia captures this feeding whale in Blackfish Sound not far from Vancouver Island’s Telegraph Cove. On normal whale watching safari day with an incoming tide to bring the herring into the viewing area we will see several humpbacks feeding. Fall grizzly bear viewing from our lodge on Knight Inlet takes place on the Glendale River and a man made salmon spawning channel. There are two viewing platforms next to the part of the river the salmon use to pass over a weir into the spawning channel. The second stand we normally use has a deep pool on one side, the natural river on the other two sides leaving the forth for a narrow road. This grizzly, in the deep pool, has it’s eye on us in the stand maybe because we made to much noise or just out of curiosity. 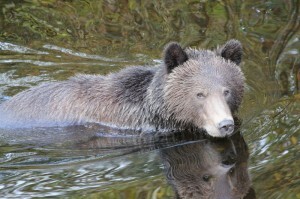 At this time of the year a grizzly bears prime concern is food namely pink salmon. Hibernation maybe a little more than two months away and this is the time to “bulk up” for the long winter. A bear without sufficient fat may not survive the winter and in the case of a female it may mean that she will absorb her “eggs” and not proceed with a pregnancy. 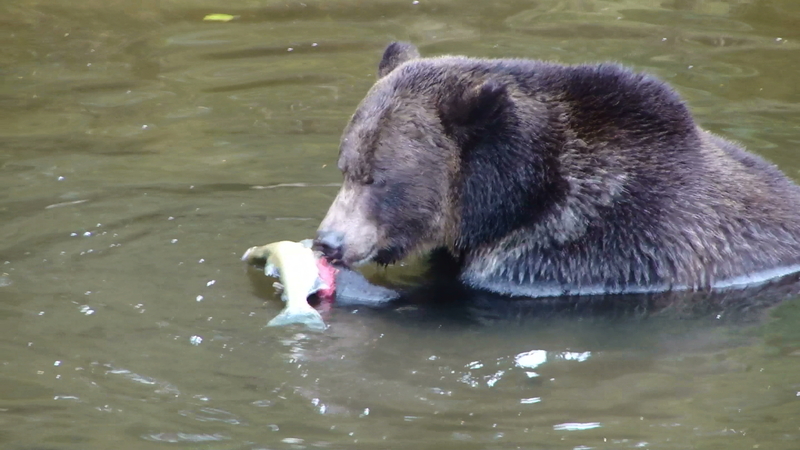 Luwen & Liwen from Singapore got a great picture of a grizzly bear on the Glendale River in Knight Inlet eating one of the favourite parts of a salmon it just caught: the eggs or roe. During the peak of the salmon run the bears have access to an abundance of salmon at that time they will eat only the parts highest in calories – the eggs, skin and brains. 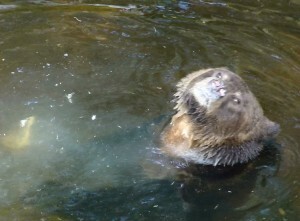 Salmon roe and skin are also high in fat; grizzlies will often discard the body of the fish, which is left for the eagles. Early is the salmon run the grizzly devour the whole fish to “bulk up” for the coming winter this is also true later in the season for those bears that have not achieved sufficient weight or fat to survive the winter. 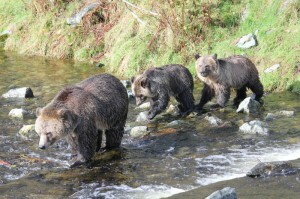 Grizzly Bear Lodge is a remote lodge meaning arrival is by floatplane from Campbell River on Vancouver Island. This is another great photo opportunity as shown by this picture from guest James O’Donoghue. 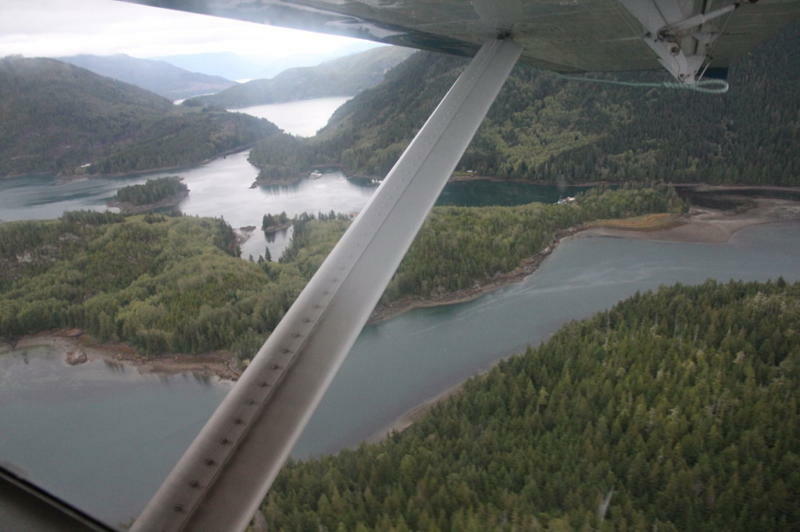 The forty-five minute flight passes over the mostly uninhabited coast except for the fish farm and logging camps. 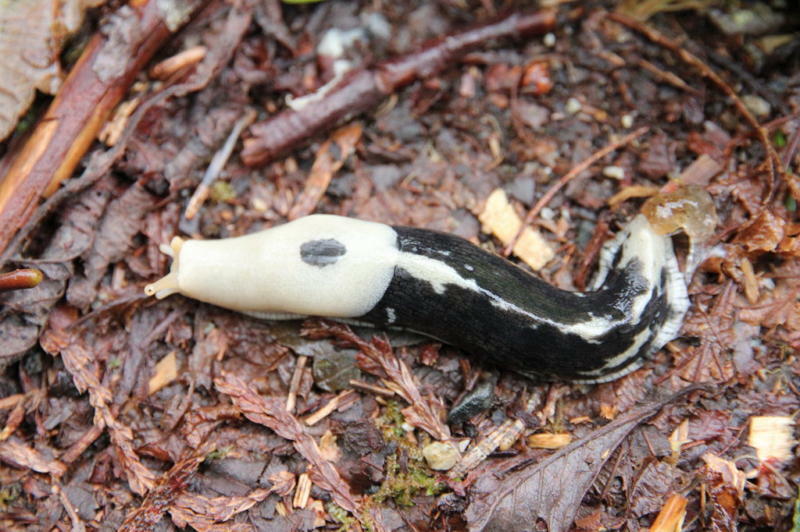 According to the website “Creation Wiki”: “The Banana slug is the 2nd largest slug in the world – the largest in North America. Banana slugs can grow all the way up to 25cm (10inches) in length.” The lodge is located in the southern portion of BC’s the Great Bear Rainforest and a rainforest does encourage everything to grow “big”. 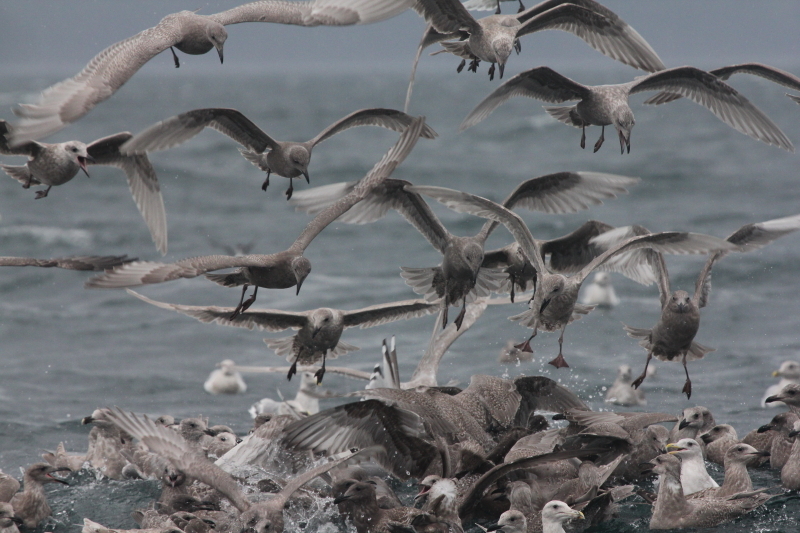 A herring “ball” results when a school of herring is chased to the surface by a predatory fish, ducks or other diving birds. Often the herring balls can be spotted by a large flock of seagulls noisily feeding on the surface. 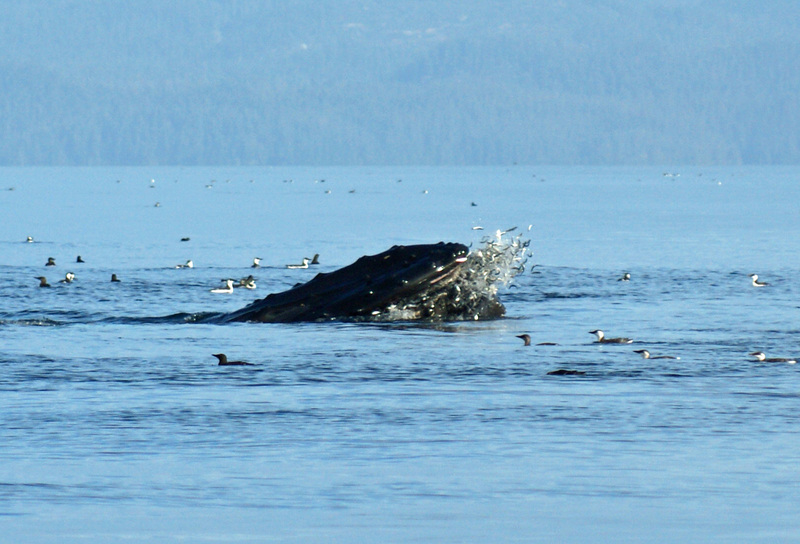 Spotting the gulls feeding is a joy for your guide as the unenviable fate of the herring is to be dinner for a larger mammal meaning humpback whales. 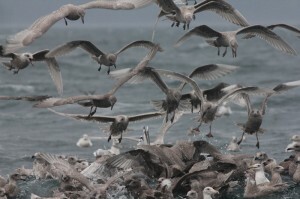 As a guide once the herring ball is located the intent is to stop the boat in proximity of the gulls and wait. “Keep your eye on the gulls and as they lift into the air get ready for a picture of a whale lunge feeding”(see tomorrow’s blog) is the directions given to the guests while we wait. James O’Donoghue’s photo captured the mass of the gulls but not the noise they produce. 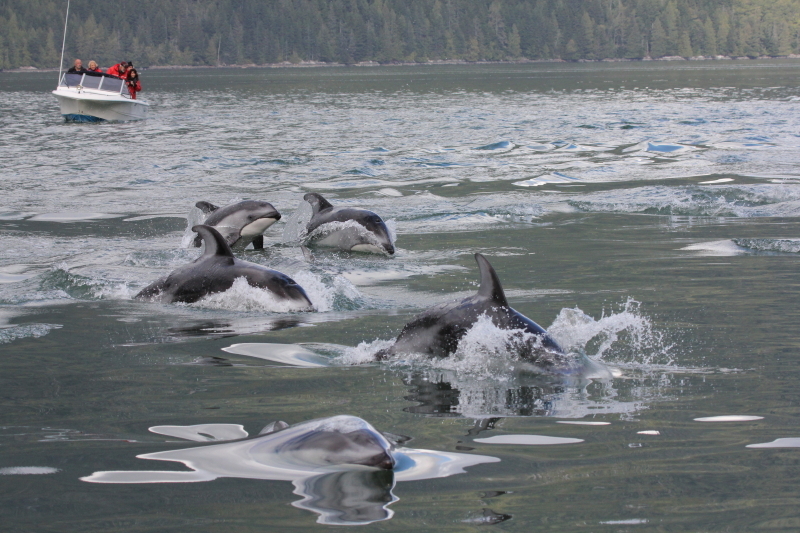 The area for the lodge’s whale watching safari day is Blackfish Sound not far from Vancouver Island’s Telegraph Cove. It is an area known for the abundance of herring and thus popular for salmon fishing which also means orca that feed on the salmon. I cannot think of another photo that I have posted of white-sided dolphins, which tells a more complete story than this one from James O’Donoghue. On tour days we frequently travel with another boat from the lodge when we run to Johnstone Strait near Telegraph Cove to look for whales thus the picture of one of our boats in the back ground. Notice the warm “floater” suits the guests wear while on the water. Even though this is summer it is cool on the water in the morning. 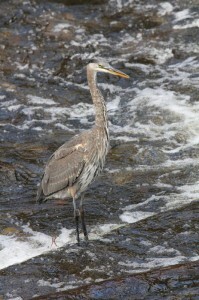 Also it is easy to pick out the guide without the suit as we tend to be climatized to the weather. The most amazing aspect of the photo is the fact that it shows every stage of white sides’ “porpoise” (short term for the way dolphins come out of the water when traveling in a hurry). 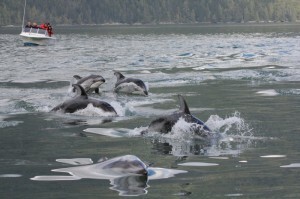 It shows them first breaking out of the water to clearing the water and then their returning dive. Also note the calm water surrounding the ripples indicating there are likely several hundred dolphins keeping the water churned up as they pass close to our boat. The abundance of salmon in the Glendale River means the grizzly bears are not very aggressive and tend to be more tolerant of each other. 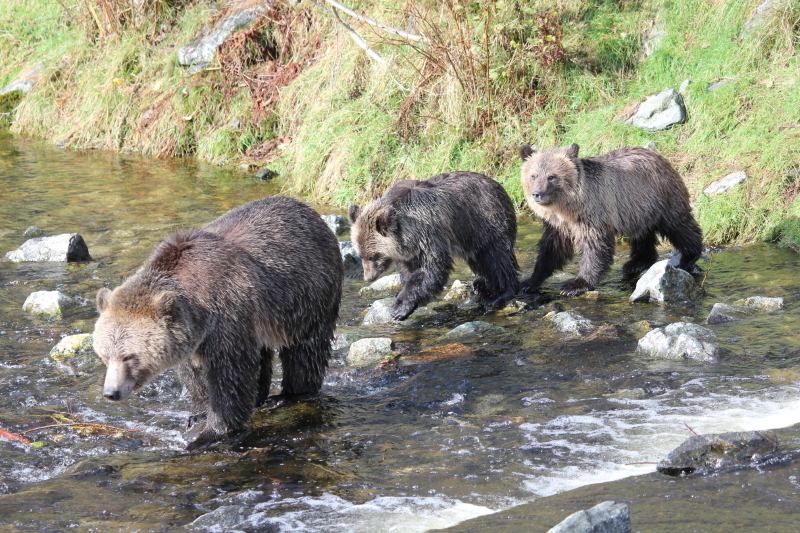 This makes for a safer location for mothers to bring their cubs to learn to fish for salmon. The first photo provide by James O’Donoghue shows a mother leading her two cubs into the fishing area and by their size these cubs would be in their second summer with mom. It is time to learn to catch salmon as it could be their last year before they are on their own although some cubs do spend a third season with mom. If you check out the waters around the bears there are not many salmon in the river so it must be early in the season this means today’s lesson may be one in patience. Excellent photos from UK’s James O’Donoghue. While in the viewing stands on the Glendale River there is always activity if you tire to the bears take time for some eagle action or blue herons. 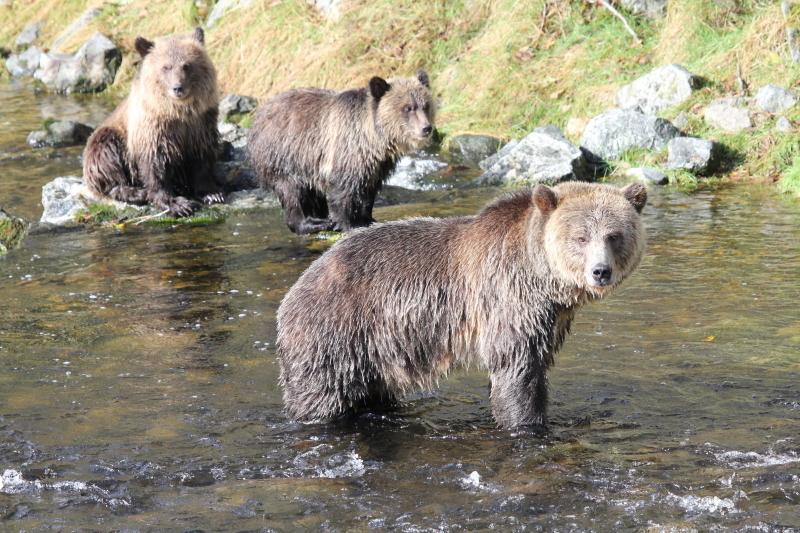 The grizzly bears are constantly leaving partially eaten salmon on the shore, which makes the eagles life much easier while the heron are searching for small trout. This eagle appears to be coming to claim some prey either a fresh salmon on a carcass. 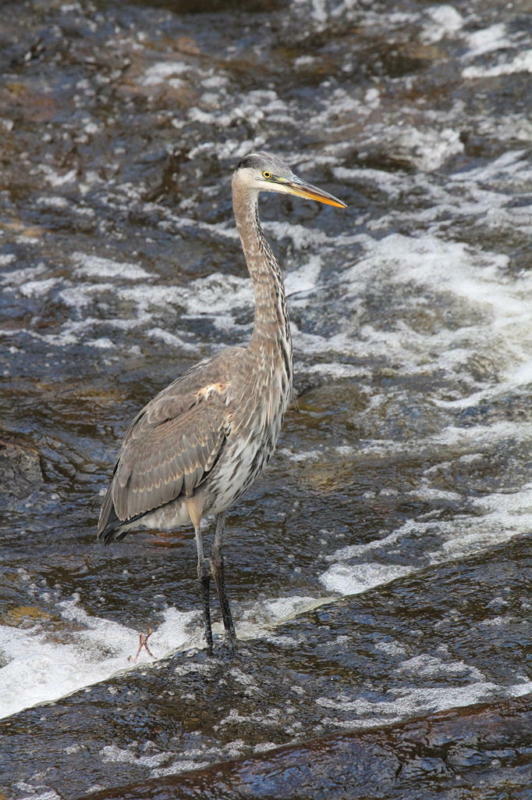 If you check the feathers above the talons they are wet making me think that a water catch was missed. 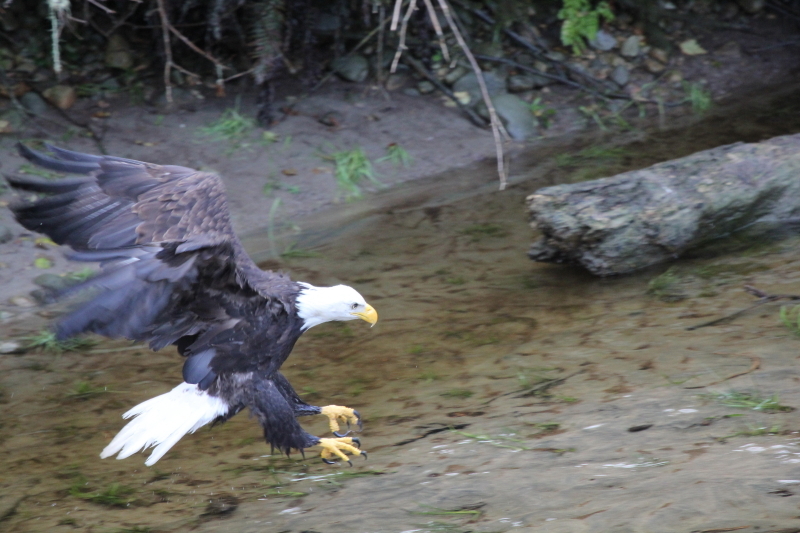 In the fall the eagle move from other areas along the British Columbia coast to the river where the is much more food and thus providing or guest with great opportunities for photo like this one. Black Bear ancestry – proof? Every tour from the lodge is a black bear tour as they are most often seen along the shore at low tide turning over rocks in search of food. 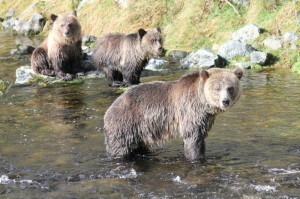 These bears do not have access to the salmon spawning rivers as they are under the protection of the grizzly bear. For a grizzly a black bear would be food for several days.